In my professional life, I often get the chance to collaborate closely with a number of other lecturers at lots of campuses and support staff. On our campus, we are blessed to have an amazing bunch of mainly ladies who run the HUB (Health, Well-being and Development Services). They do everything from help students with financial crises, teach inventive meditation students to stressed exam students, offer an ear to tales of woe, immunise us against flu epidemics, cater to our spiritual well being, and go above and beyond the call of duty to support our disabled students and help students effectively plan for their future careers after they finish their degrees. One of my subjects includes a career planning component and so I get to team teach each semester with the Careers Advisor. She needs an enormous pat on the back for more than holding up her half of the bargain. I always know that it will run to plan and everything will come together on the day when I work with her. So this year (after a brilliant careers panel, lecture and tutorial) I felt it was time to tell her I noticed all the effort with a random gift. 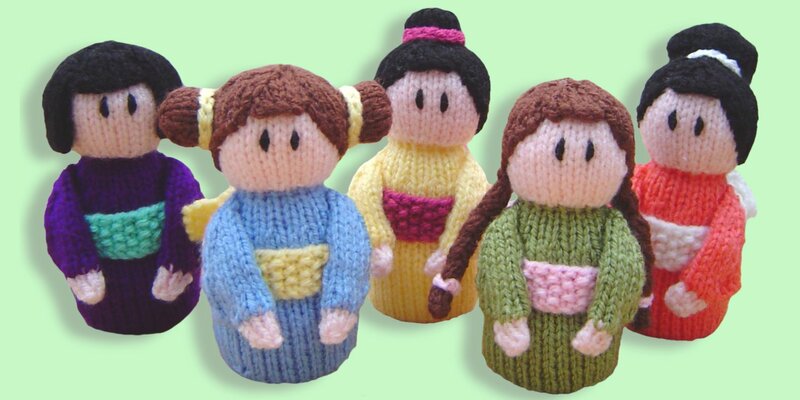 When I first saw the pattern for these Little Kimono Ladies by Clare Scope-Farrell in Issue 86 Of Simply Knitting I knew I had to make some of them. I quite often make little random gift knits so I have something on hand as a small gift when I need one. I decided to make the peachy coloured one first partly because it has such a cool pigtail. Here is the stuffed body and head piece. I made one slight change to this and used the lid of a juice bottle in the base of the body rather than a cardboard circle as suggested. I was really impressed with how well this worked. It makes a really stable, solid base. Various members of my family made very rude comments about what this looked like at this stage. Use your imagination.